My first post was three years ago on November 30, 2007. Not much has changed in the hedge fund world, hedge fund returns remain correlated to the stock market - an indication that it's all one giant risk trade. Mr. Maurice Levesque, Managing Director, President of Qwest Investment Management ("Qwest") said, "Investors around the world have been challenged by the volatility stemming from significant outbreaks of asset inflation and deflation. Prominent economists and investors remain completely divided in their opinions on the macro-economic outlook. Individual investors will be faced with volatile swings in the markets in the years ahead and will need to know when these major trends change and what assets will respond positively to the change in trend." In response to this investment environment, Mr. Hui developed and launched, in 2009, the Qwest Inflation-Deflation Timer Model (the "Timer Model"), a proprietary quantitative investment model used to identify inflation and deflation trend changes. Mr. Hui explained, "I will use the trend signals from the Timer Model to allocate the Fund's assets into specific asset classes that traditionally respond positively during an inflation trend, a deflation trend or a neutral trend." The fund is available to Canadian residents only. If you would like a prospectus please contact Cindy Bower at cbower at qwestfunds dot com (note the spam protected email address). I don't know Jeremy Grantham personally, but we both worked at Batterymarch Financial Management, which was the firm he was at just before he left to found Grantham Mayo Van Otterloo (GMO), an asset management firm with over $100 billion in assets. I finally got around to watching the recent Grantham interview with Maria Bartiromo of CNBC outlining his outlook, which is well worth the 29 minutes of your time. I was surprised to see how much my outlook agreed with Grantham's. While there were some minor points of disagreement, they were minor. Grantham's views sound a lot my inner investor vs. inner trader debate. Despite his reservations about equity valuations and macro risks, he seems to be resigned that the S+P 500 may be frothy enough to rally to as high as 1500, before falling to GMO's fair value estimate of about 900 on the index. I agree with Grantham's belief, which I have written about before, that there is significant macro risk in the financial system. The Federal Reserve has undertanken to blow serial asset bubbles, the latest being QE2, which will lead to rolling boom-bust cycles. The Fed balance sheet is already precarious in the wake of QE2. While they may be able to rescue the situation right now, at some point it will all come down like a house of cards. When that happens, the fallout is going to be really, really ugly. What's more, QE2 is a form of currency depreciation, which is upsetting America's trading partners and risking currency wars. Its effects are showing up, not so much in the FX markets, but in commodity prices. On the other hand, just as my inner trader told me not to worry and enjoy the party that the Fed was throwing. Grantham reluctantly allowed that the stock market could rise even further from current levels. We are both long-term commodity bulls but for different reasons. Grantham's bullishness stems from his belief that the supply-demand equation has shifted from commodity consumers to producers. Emerging market countries are growing a lot faster and their rising resource intensity is putting upward pressure on demand. Where I differ: I am a little bit more skeptical about the commodity bullish supply-demand story. I am a long-term commodity bull because I believe that the pressures from overly accommodative global fiscal and monetary policy are likely to manifest themselves in higher commodity prices. Grantham believes that the biggest macro risk is a full-blown currency war, which would have similar effects as the Smoot-Hawley tariffs had during the Great Depression. Where I differ: I just worry about tail risk, which can be either inflationary or deflationary. In no particular order, here are some of the events that may set off another crisis: China slows into a hard landing, more deflationary pressures in Europe, e.g. Spanish real estate falls another 30%, or the Germans balk at supporting their EU brethrens, the fragile US economy slips into a double-dip recession. Should any one of these time bombs blow up, how will the authorities respond? GMO's assets of choice are high quality US stocks and emerging market equities. These are reasonable investment solutions for institutional investors who are constrained largely to a buy-and-hold discipline. In some ways, the high quality stock approach is a close cousin of David Rosenberg's SIRP (Safety and Income at a Reasonable Price) strategy. Where I differ: Given the backdrop of low returns and a volatile economic outlook (i.e. a rolling series of financial crises), I believe that investors should employ more dynamic asset allocation strategies to play the swings, such as my Inflation-Deflation Timer Model. In summary, we both agree that there are significant macro risks. We just differ on how investors should address the situation. A silver lining in the global outlook? China now spends about 50 percent of its gross domestic product on a broad category economists call investment — roads, bridges, trains, ports, technology, factories and office buildings. That is the highest share in recorded history. During their great booms in the 1960s and ’70s, Japan and South Korea never topped 40 percent. China itself was spending 35 percent only a decade ago. One businessman told me he knew that most outsiders thought of China as a top-down, centralized country. “But China is a collection of special interests,” he said, “like the U.S.” Leaders understand that suppressing labor unrest may help economic growth in the short term by holding down wages and thus the price of exports. But many also know that economic discontent risks political instability of the kind that in the last century alone toppled an emperor and Chiang Kai-shek, led to the chaos of the Cultural Revolution and threatened the current regime in Tiananmen Square. Analyst like Stephen Roach of Morgan Stanley has warned for years about the risks of uneven global growth. Put simply, Americans consume too much and the Chinese consume too little. Indeed, the main planks of China's latest five year plan is to encourage more domestic consumer spending and to migrate up to the value-added ladder to more design oriented growth. The most obvious and most prominent consideration for the 12th Five-Year Plan is, where will the global market go in the future? And an important question is, how do we create a large domestic market? In the past, what was proposed was transforming the economic growth model. Transforming the economic growth model means increasing efficiency, which involves Paul M. Romer’s New Growth theory, which is to improve total factor productivity and the knowledge content of growth. Transforming the economic growth model is really improving the efficiency of supply. The transformation of economic development proposed by the 17th National People’s Congress mainly implies three things. The first is the transformation of the aggregate demand structure, which means shifting from economic growth that relies on exports and investment to a model of balanced consumption, exports and investment. The second is transforming the supply structure from a model of growth driven by secondary industry to a model of balanced growth driven by primary, secondary and tertiary industries, with the service industry in particular playing a larger role. Third is the transformation of factor inputs, from quantitative expansion to comprehensive growth relying on knowledge, technology, management, etc. If China indeed experiences a rapid slowdown in GDP growth, the impact on the rest of the world may be far less than we expect. The real key is the evolution of the Chinese trade surplus. If it contracts, it will provide an expansionary boost to the rest of the world, not a contractionary one. Of course that doesn’t mean that the world will grow quickly. My expectation is that global demand growth over the next several years is likely to be anemic with or without China. But it does man that a slowdown in Chinese growth might not be the disaster for the world that many believe. Also a rapid slowdown in Chinese growth does not mean a social or political disaster domestically It depends on how serious China is about rebalancing its economy. If policymakers are willing to force up interest rates and wages, most of the adjustment pain will be borne by SOEs and the state sector, not by the household sector. In that case we might see a slowdown in Chinese consumption growth, but one not nearly as severe as the slowdown in Chinese GDP growth. Since the Chinese, like everyone else, probably measures their well-being in terms of purchasing power per capita, rather than GDP per capita, a sharp slowdown might not be nearly as painful as we assume. If China were to gradually achieve more balanced growth in the next decade, then this could indeed be a silver lining for the outlook in the decade ahead. When equities sold off on euro-contagion fears and on the news from Korea on Tuesday after failing at key resistance levels, is it time to panic? My inner trader continues to believe that the Fed wants to throw a party. So let's have some fun, maintain trailing stops and don't worry. The one caveat to this outlook is - we should party as long as China doesn't slow down into a hard landing. So long as China does not overdo it on its tightening moves — raising reserve requirements is indeed preferable to interest rate hikes — then commodity prices in general should remain on an uptrend even if a corrective phase should be expected after the QE2-related surge of the past few months. There is enough evidence supporting the notion that the Asian economy has decoupled from the U.S. consumer, and therefore, basic materials should still be a core holding in any given investment portfolio. China’s biggest banks are poised to hit government-set caps on lending and plan to stop expanding their loan books to avoid exceeding the annual quotas. With news like that, we will no doubt see a China growth scare in the weeks to come. The key to the market’s outlook is the Chinese plans for next year. Will they continue to tighten? Or with growth slowing, which heightens the risk of economic pressures and unrest from rising unemployment, will the Chinese authorities step on the accelerator again? I believe that the latest round of quantitative easing by the Federal Reserve will have the effect of exporting asset price inflation to China, whose effects are unavoidable as long as China maintains a managed USD-RMB peg. Any administrative effects such as restricting bank loans or raising reserve requirements are therefore likely to have minor effects on the Chinese economy. Does the US avoid a double-dip? As Americans sit down to Thanksgiving dinner, it appears that the US may have avoided a double-dip recession. The 3Q GDP print at 2.5% was ahead of the consensus of 2.4% seems to be one sign that the economy is more robust than the bears believe. I have also been monitoring the relative performance of the Morgan Stanley Cyclical Index (CYC), which is shown below. The CYC appears to be forming a bullish ascending triangle relative to the market. While the formation isn't complete until we see an upside breakout, these are not signs of a market that is likely to show significant weakness beyond the normal 5-10% corrections that may occur from time to time. On the bearish side, the market remains overbought and sentiment is at or very close to crowded long territory, which is contrarian bearish. These factors suggest that equities are vulnerable to minor corrections but should be bought on weakness. I get the feeling that we are approaching the end of an era. Independent central banks appeared to solve the problem of defeating inflation, but there was always a democratic issue. We have now reached the stage when central banks are being asked to do things that politicians know that the electrorate would not be willing to support, a trend that arguably goes back to the Mexican bailout of the mid-1990s. It does not seem sustainable. The Federal Reserve, after facing much criticism of its QE2 program, has had to take the unusual step of publicly defending itself. Across the pond, Bundesbank president Max Weber warned six months ago that the ECB is eroding "its independence by financing debt-strapped nations and keeping banks on life support as Europe’s debt crisis persists." Now those warnings of those risks may be materializing as beyond Ireland lie the other periphery eurozone countries. One of the roles of monetary policy played by central banks is to act as a counterweight to fiscal policy, which tends to be more politically driven. While I have expressed my own concerns about the effectiveness of QE2 and I do believe that the Fed's operations are overly opaque and audits may be beneficial, I would nevertheless support the principle of central bank independence. If central bankers were to come under the power of politicians, then monetary policy can no longer be the counterweight to fiscal policy. Down that road is economic instability, banana republics and Zimbabwe. Will the real Warren Buffett please stand up? Since the 2009 Op-Ed, the current account deficit has widened and the fiscal deficit has taken off like a rocket. We now have unprecedented levels of "greenback emissions" in the form of QE2. How is the government then doing such a good job? I suppose that the better question might be: "Who are you and what have you done with Warren?" The Geithner Gang rides again? In the bad old days when emerging markets were really, really emerging, there were stories out of places like Russia where property rights were blatantly ignored. Share registers were routinely changed, or shareholders would be physically barred from shareholders' meetings by thugs, where existing shareholders' interests were diluted to nothing, sometimes without disclosure or warning. The legislation is already being drafted under the interstate commerce clause to ratify MERS and everything it did retroactively. It appears that the Obama administration is ready to pardon all the securitization deviants by signing this bill into law. If this rumor is true, then the Geithner Gang is ready to ride again. Where is the outrage? 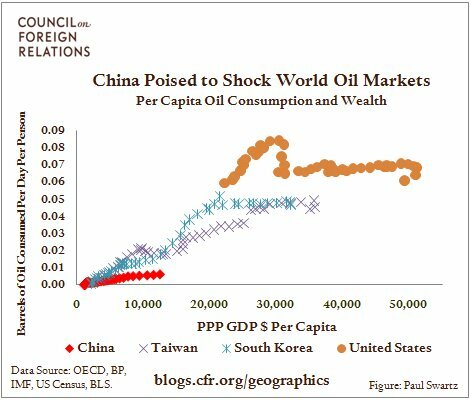 Their comment was that China is rapidly approaching the $15,000 GDP per capita level when oil consumption intensity starts to rise. Given the vastness of Chinese population, this would mean that global oil demand would take off like a rocket [emphasis added]: "Were China’s per capita oil consumption to be brought up to South Korea’s, its share of global consumption would increase from today’s 10% to over 70%." By implication, such a development would be incredibly bullish for oil and other energy prices. Does the new five year plan mitigate demand? In other words, China's aim in the latest five year plan is to move from low value-added production up to higher value added production, both for domestic consumption and export. Romer calls it growth based on creativity, i.e. more design. Michael Porter would call it moving up the value-chain. In the past, China's insatiable demand for natural resources has been the result in some silly projects, e.g. inefficient steel plants. This mis-allocation of capital has gobbled up a lot of natural resources such as iron, copper, coal, oil, etc. A transformation of the economy that is more oriented to higher value-added and more creative design oriented output is likely to dampen some of the oil and other raw material intensity nature of the Chinese economy. Long-term bullish or bearish for energy? Does this mean that crude oil demand intensity is not poised to skyrocket as per the Center for Geoeconomic Study chart above? On the bullish side, we have seen this same level of rising affluence drive up energy demand in other countries. On the bearish side, the Chinese government seems to be at some level working to restrain energy and other natural resource intensity of their economy. Don't forget the transformation in the American economy in the 1980's, when prolonged oil prices resulted in more efficient use of energy, e.g. smaller cars, etc., and oil demand dropped as a result. I am still leaning bullish on the case for rising oil demand. However, there are risks to this story and the bearish case shouldn't be ignored. Addendum: Further to my post, I see that the latest IEA report concludes that oil demand would peak in 2020 if CO2 is cut aggressively (also see story here). While it is unlikely that individual countries would adhere to global accords on CO2 emissions, it does show that efforts to cut consumption, such as fossil fuel subsidy reductions, can have a significant impact on demand. War drums on Remembrance/Veterans' Day? The signs are pointing towards an unfortunate destination. Earlier this year, we wrote about the percolating cross-border problems, from the Flotilla friction to Iran tensions to saber rattling on the Korean Peninsula to leaks of Afghan war logs, with European social strife on the rise and a global play for crude mixed in for good measure. Sovereign posturing is ever-present and on the rise. Can you feel it? Personally, I think that Harrison's point about World War III are a little over the top. Nevertheless, his contention is well taken. It seems to be that while there is no immediate threat of war, the current economic conditions represent fertile ground for conflict over the next few years, regardless of whether it's economic or the fix-the-bayonets-and-go-over-the-hill kind. I agree with Harrison that people are nervous, cranky and jumpy all over. Risks are therefore rising. Personally, I believe that the risks are more tilted towards social and economic risks than a shooting war but the probability of war over the next few years is not zero. Using Factors to Dynamically Manage Pension Fund Risk - Pension Funds are complex systems with many moving parts. A sponsor needs to be concerned about the behavior of the assets, the behavior of the liabilities, and how the two interact. We look at representative Canadian plan and its sensitivities on both the asset and liability side and how they interact and then suggest some asset allocation strategies that can be used to better manage the return dynamics and funding stability of the plan. If you are around in Boston next Tuesday, you may consider attending. Click on the link above to get all the details. The reaction to the Fed's QE2 program has come hot and fast. Emerging market authorities are complaining loudly about QE2. From Brazil to South Africa, the reaction has been swift and negative. China’s Vice-Foreign Minister Cui Tankai said that the US “owes us some explanation on their decision” and PBoC governor Zhou Xiaochuan complained that QE2 “is not necessarily optimal policy for the world”. In central banker-speak, that's somewhat akin to Emperor Hirohito's announcement to the Japanese people at the end of WW II "that the war has not necessary unfolded to our advantage. Beyond the complaints, it will be telling to see how the capital exporters like the OPEC Gulf states and China react. QE2 will export asset inflation to China and push up the prices of real estate and rare antiques. It is difficult to interpret Bernanke's defense of QE2 as anything else but an attempt to replace the recent bubble with yet another - to drive already overvalued risky assets to further overvaluation in hopes that consumers will view the "wealth" as permanent. The problem here is that unlike housing, which consumers had viewed as immune from major price declines, investors have observed two separate stock market plunges of over 50% each, within the past decade alone. While investors have obviously demonstrated an aptitude for ignoring risk over short periods of time, it is a simple fact that raising the price of a risky asset comes at the sacrifice of lower long-term returns, except when there is a proportional increase in the long-term stream cash flows that can be expected from the security. As a result of Bernanke's actions, investors now own higher priced securities that can be expected to deliver commensurately lower long-term returns, leaving their lifetime "wealth" unaffected, but exposing them to enormous risk of price declines over the intermediate (2-5 year) horizon. This is not a basis on which consumers are likely to shift their spending patterns. What Bernanke doesn't seem to absorb is that stocks are nothing but a claim on a long-term stream of cash flows that investors expect to be delivered over time. Propping up the price of stocks changes the distribution of long-term investment returns, but it doesn't materially affect the cash flows. This reckless policy has done nothing but to promote further overvaluation of already overvalued assets. The current Shiller P/E above 22 has historically been associated with subsequent total returns in the S&P 500 of less than 5% annually, on average, over every investment horizon shorter than a decade. The world seems full of smoke ahead of a world currency war. The weapon of choice is quantitative easing (QE). If you print a trillion, I'll print a trillion. No change in exchange rate after a trillion? Let's do it again, QE2. I think China's currency is overvalued. China's money supply has exploded in the past decade, rising from RMB 12 to 70 trillion. Every currency has experienced depreciation after a pronged bout of money growth. China's industry has risen tremendously to justify part of the growth. However, a massive amount is in the overvalued property market. When it normalizes, the money flows out and the currency depreciation pressure happens. We should see this within two years. 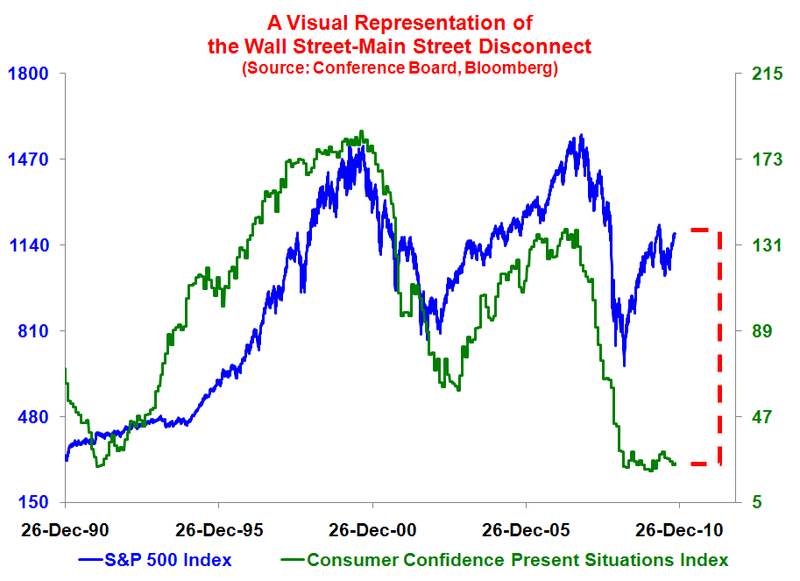 Michael Panzner posted a graph showing the disconnect between Wall Street and Main Street, in the form of the stock market and US consumer confidence. 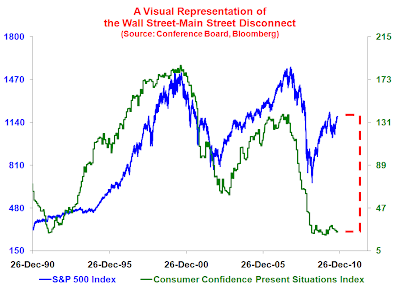 Notice how they tracked each other until the Lehman Crisis, when the market took off but consumer confidence stayed flat. QE2 is likely to increase that gap by rewarding the holders of capital by blowing another asset bubble while the suppliers of labor have to suffer the consequences of higher food costs and possibly higher prices of consumer goods made in China. Recall that even the worse days of the Weimar Republic hyper-inflation, there were clear winners and losers. All that stimulus meant a roaring stock market, which rewarded the holders of capital, while the ordinary working people suffered. We know how that story ended. It may not come to a repeat of the German experience, but the risks are there. Barry Ritholz points out that already, affluent Americans are more confident now than 2009. I also suggested before that QE2 has the potential to ignite class warfare. Meanwhile, my inner trader says that the Fed is intent on throwing a party so let's enjoy it and maintain tight trailing stops. Don't worry, be happy! On Monday I wrote that this would be a momentous week for the financial prices and suggested that it may be time to sell the news. Now that the mid-term elections and the FOMC decision has come and gone, what's the verdict? In the spirit of elections, where conceding politicians use the words "the People have spoken", I now write "the Markets have spoken." When the Fed chairman mensions stock prices twice in the same paragraph, it would be foolish not to pay attention. In reaction, commodity prices are skyrocketing and the USD has fallen through an interim support level. If there is gridlock, then monetary policy will have to do all the heavy lifting. That will lead to a highly risky unbalanced policy by the United States. More telling is Kid Dynamite's characterization of the comments of Bill Gross, which is "sold to you sucka" as a response to the Fed's QE2 program. "To your question of selling or buying treasuries - I think for the most part those that should have bought them have bought them already and that would include PIMCO and that we would be looking forward to "handing them off" so to speak as we accelerate towards that outer orbit." In other words, Gross and others front-ran the Fed in its QE2 program and is now "handing them off" to the Fed. If an institution the size of Pimco wanted to sell, the Fed would be a perfect candidate as a buyer. The rest of us mortals whose portfolios are a fraction the size of Pimco's AUM and the Fed's balance sheet can afford to be more nimble. My inner trader, who vehemently disagrees with my inner investor, believes that the Fed is intent on blowing another asset bubble. Already, we have commentators like Barry Ritholz and Simon Johnson warning against the likely watering down of the Volcker Rule. Such actions, it is believed, will lead to a repeat of the financial excesses that toppled Bear Stearns and Lehman Brothers. My inner trader says, "Don't worry, be happy! These policies are bubblicious. They are supportive of the asset bubble that the Fed wants to blow, so relax and go with the flow." In that case, this will mean a momentum driven market where fundamental don't matter. The first week in November will indeed be momentous and full of wild cards. We will see the US mid-term elections, followed by the FOMC meeting in which QE2 is expected to be announced. Right now, the market consensus for both events are both equity bullish. However, it's important to examine the implications of these events to see if they are indeed bullish. Is deadlock really market bullish? The Republicans are expected to take back the House, but the Democrats are expected to narrowly retain its Senate majority. The Street consensus has been "deadlocks are bullish for the markets", but is it really in this case? As for the upcoming FOMC meeting, I wrote about it before here and pointed out the risks that QE2 could spell the end of Bretton Woods 2. The market is pricing in about $1 trillion in QE2, while signals from the Fed is that it will be substantially less, with room for "flexibility" to raise the program if necessary. This, to me, seems to be a recipe for disappointment. The Obama Administration is poised to turn its attention to deficit reduction, seemingly oblivious to the historical errors of Japanese fiscal policy, not to mention the US experience in the Great Depression. For better or worse, that leaves monetary policy to bear the burden. But the Federal Reserve is signaling they are poised to deliver far less than necessary to meet expectations, expectations that already were likely overly optimistic. And does the issue of "flexibility" only go one way? To be sure, Fed policymakers will argue that they are trying to preserve flexibility. Why is it that "flexibility" means the ability to scale up? Why can't "flexibility" mean the ability to scale down? Seriously, it is not as if the Fed is in any danger of hitting either of the objectives in the dual mandate anytime soon. And does Bernanke really believe that it will be any easier to offer a credible commitment to scale up once Dallas Federal Reserve Chairman Richard Fisher is a voting member of the FOMC? Are the markets getting leery? Bespoke's analysis of the stock market during mid-term elections indicated that equities have an upward bias for election day and for the week. Given the high expectations and the risks to these events, perhaps it's time to "sell the news"?